What is your favorite flavor of ice cream? For me it has always been vanilla and banana. 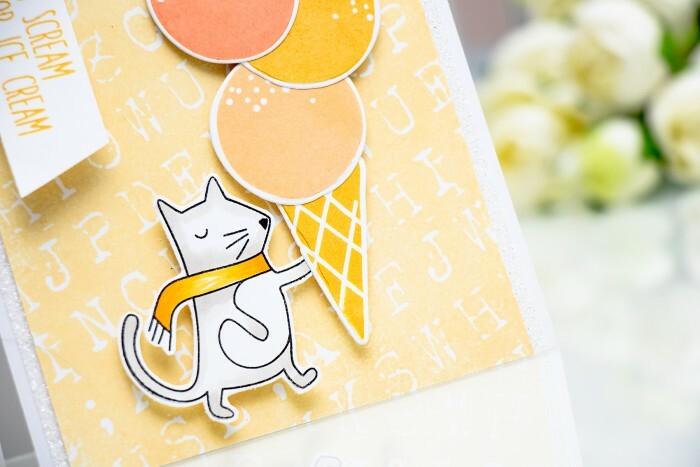 The little kitty-critter (I have no idea if this is a cat or a mouse or some other animal) I have on my card today seems to like all sorts of different flavors lol! I was filming a video (will share in a few days) the other day and I colored a bunch of these critters and happened to have an extra little one so I gave him a big ice a cream to enjoy. Love how how handsome he looks with that ice cream and his scarf. 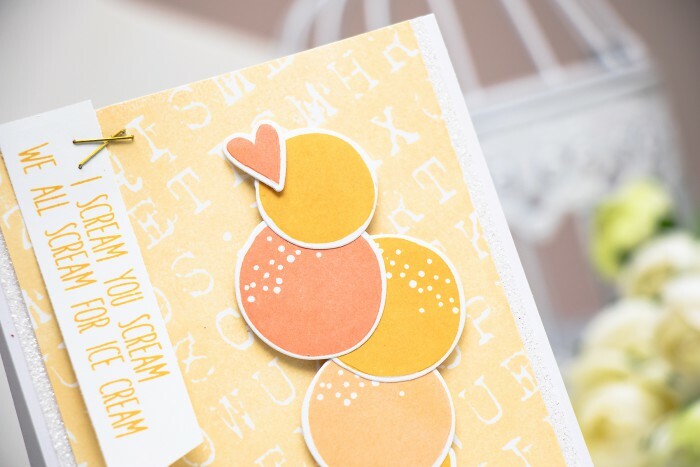 I used my new current favorite Grunge Letter Background cling stamp from Simon to stamp a background (after I used it out on this card I can’t stop reaching for it), I used a very light Duckling Yellow Ink for stamping so that it would not distract from the rest of the card. The little kitty-critter was stamped using Intense Black Ink onto white cardstock and colored using a few Copic markers (I only used W1, Y13, &17 and C9), there’s no matching die for this image so I just cut it out using scissors. 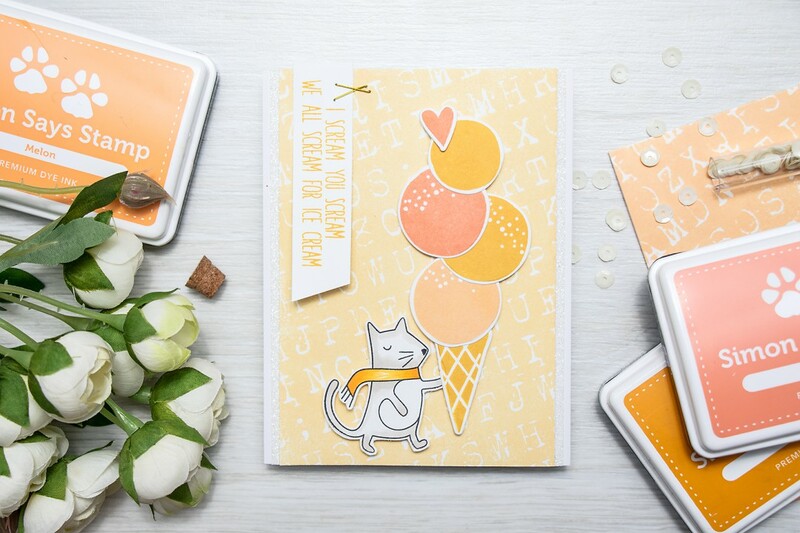 I stamped the ice cream cone using Sunshine Yellow Ink to match the kitty’s scarf and used the following to stamp the scoops: Melon, Apricot and Sunkist. Sentiment was also stamped using Sunshine, I adhered it in place but also used gold staples as a little decorative touch. No card of mine is done without glitter lately, there are 2 strips of white glitter tape added on both sides of the background panel (I used American Crafts self-adhesive glitter tape). Mine is coffee. But coffee flavor wouldn’t look so yummy on a card I think. So fun and bright creation! I love your colours and cards. Mine is vanilla and peach. Thanks for the brightly coloured card. 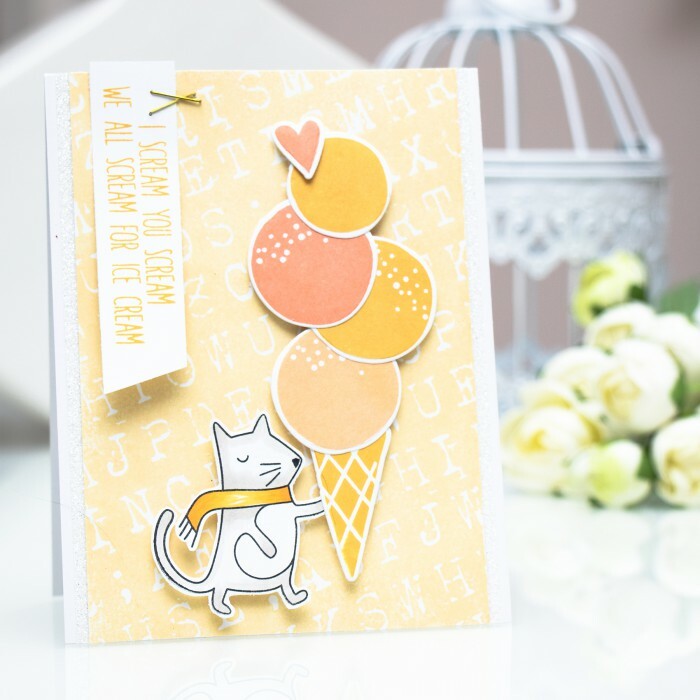 Beautiful card done with beautiful colors!